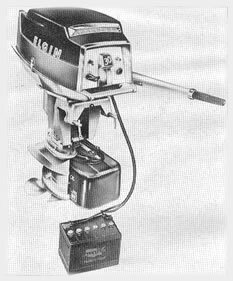 Sears, Roebuck and Co. announces a restyled line of 1957 Elgin outboard motors, with multi-color interchangeable engine covers in a modern jet-fin treatment. Heading the line is the 30-hp. model certified at 4200 r.p.m, with a 12-volt electric starting system and battery re-charging generator said to maintain battery charge under starting loads and running-light operation. A translucent starter button on the engine control panel lights up electrically to serve as a charging indicator. The Elgin line also includes twin-cylinder models rated at 5 1/2, 7 1/2 and 12-hp., plus an air-colled 2-hp. fishing motor. Manufacturer: Sears, Roebuck and Co., 926 S. Homan Ave., Chicago 7, Ill.